— What is the best high-performance quad? Well, if you’re talking about what you can buy new in 2018 then that would have to be Yamaha’s YFZ450R. However, if you were going to include all quads made in the last 10 years, then you’d have to consider the KTM 505 SX. 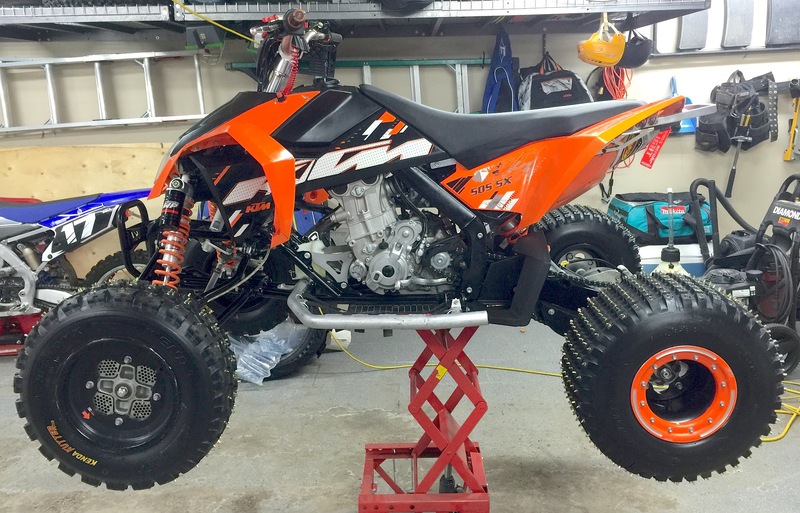 Stephane LeBlanc is a Dirt Wheels reader who owns a 2010 KTM 505 SX and he seems quite pleased with it’s performance. The photo of it here shows that he keeps clean, well maintained and in good shape. It’s a shame that KTM no longer makes this machine. If they did, it would only have to compete with Yamaha’s YFZ450R and Raptor 700. Perhaps we should all stop by our local KTM dealerships and convince them to bring their quads back. The factory does listen to their dealers. Anyway, let’s take a look at Stephane’s 505 SX and analyze what makes it such a great quad. 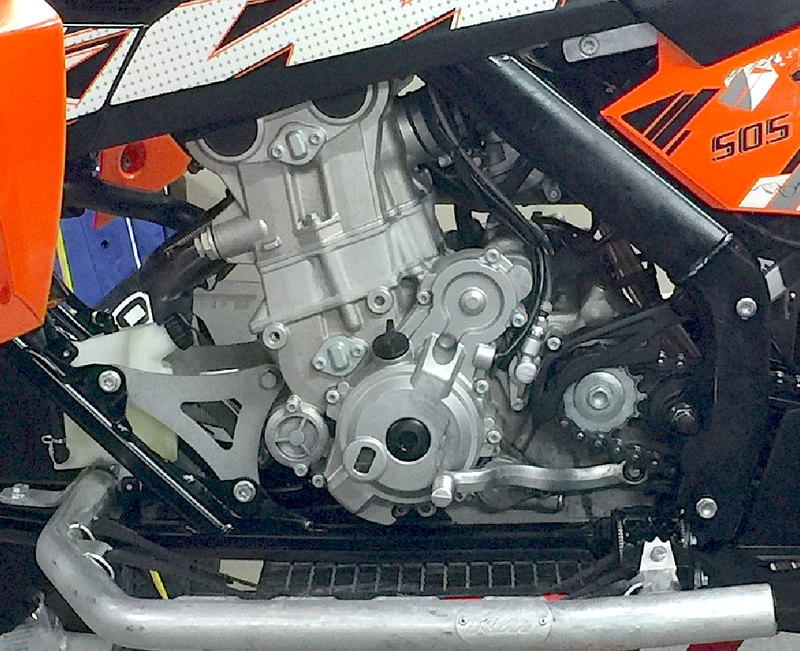 If you paid attention to the first KTM quads you’ll notice that this engine looks different from the XC models. That’s because it has two camshafts in the head. The other one had a single cam with rocker arms pushing open the four valves. The SX has the cams pushing the valves open directly, which reduces mechanical motion that allows it to rev quicker and higher. More revs equal more horsepower when you’re looking at a dyno sheet. In the photo of Stephane’s 505 SX you’ll also notice that it has metal screws in the knobs of the tires. Yes, he has it set up for ice racing. He lives in Alberta, Canada and up there the only place to race for around 4 months out of the year is on frozen lakes. The metal screws actually provide decent traction while still allowing you to get a little sideways when powering out of the turns. 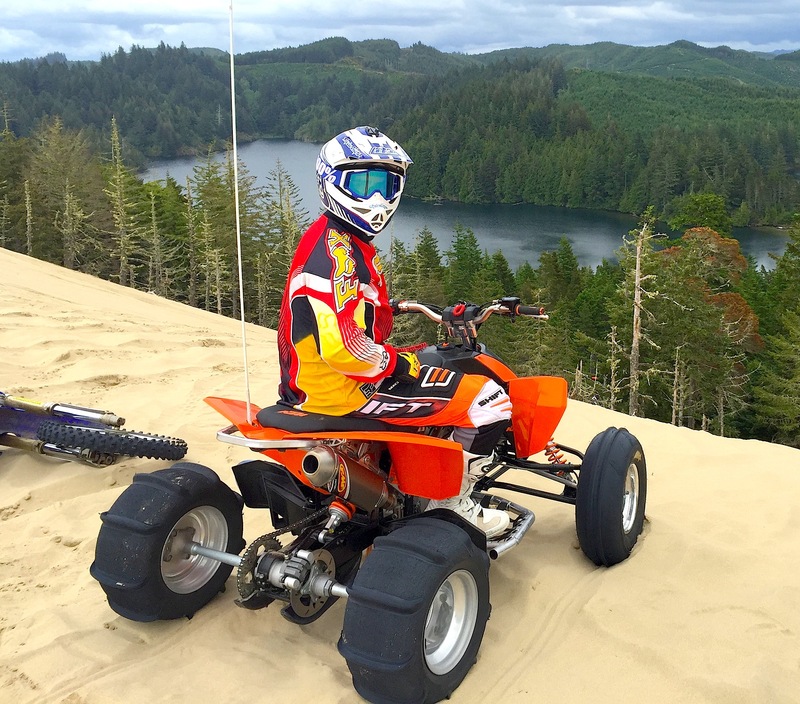 Stephane also likes to ride the sand dunes during the warmer months and his preferred destinations are south of the border in the USA. He regularly heads to St. Anthony Dunes in Idaho and also further west to the Oregon coast. This photo shows him at Winchester Bay. Wouldn’t we all love to be in that scene on that machine? You could call that the definition of ATV paradise. Send your Reader’s Rides to us with photos, info, your name, city & state.